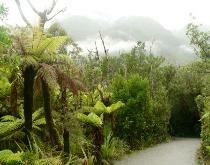 The rainforest leading up to the glacier. they tell the group of people signed up if it is going to be cancelled or not due to the weather conditions. Rain. And a whole lot of it. I knew that any plan I had of taking a helicopter up to the top of the glacier and hiking on the ice had come to a screeching halt. part in it so I knew it would be something I would do when I was free to roam the country by myself. Easter Island budget as I just decided a few days ago that I am definitely heading out there while I’m in Chile). On the not-so-bright side, I never even got to see the Fox Glacier because the rain was pounding down when I left the area today. I will just have to capture it via my friend’s pictures. 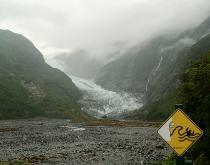 coming into Fox Glacier. I think even DeBarge would have been proud. of by seeing them face-to-face. 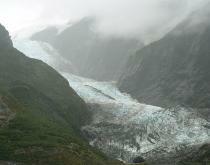 I had been one glacier before in my life when I was in France. It was right outside of Chamonix. the odds are stacked against me to go walking on a glacier today.